We Spoke plays Touche Nature by I-lly Cheng. © I-lly Cheng. A contact microphone is attached to the bowl and amplifies the bowl itself and the water movements in the bowl. Four percussionists each play a bowl filled with 1,000 ml. of water. 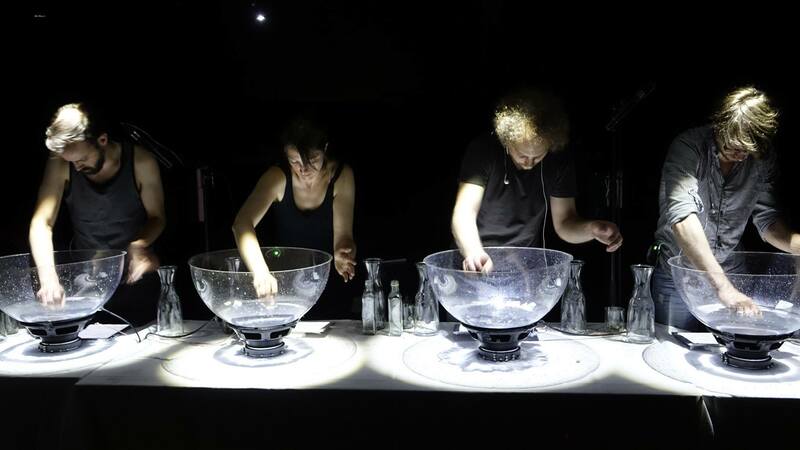 During the performance the percussionists produce sounds by moving the water with their hands, rubbing the bowl, throwing stones in the bowl, or pouring more water into the bowls. These sounds are all picked up by the contact microphones and then amplified through the PA system. The water sound itself is also picked up by four condenser microphones and amplified directly through the loudspeakers in the hall. 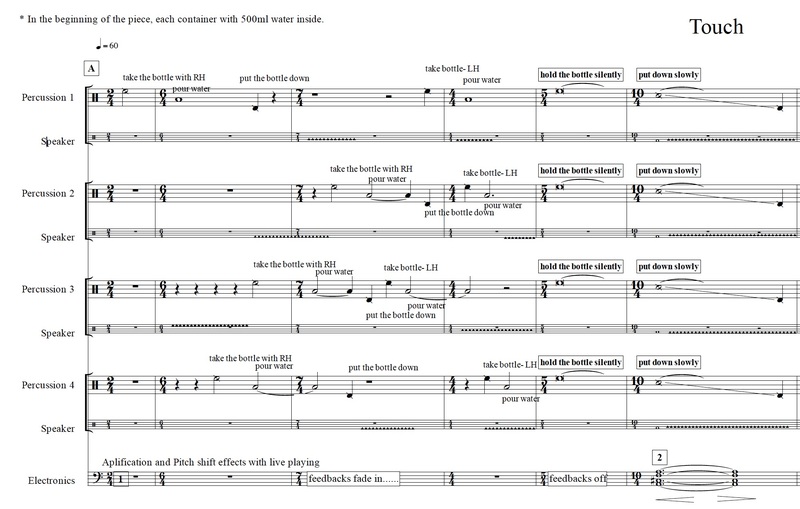 As the first page of the score shows, the sound is processed with a pitch shift effect in the computer and there is also some feedback used. 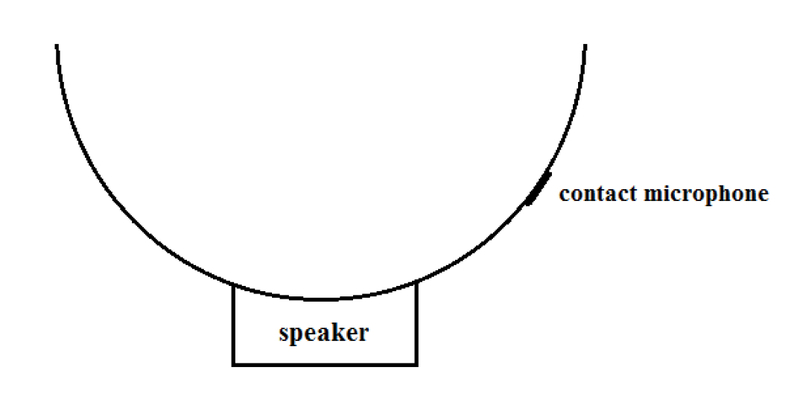 The feedback is created by sending the signal of the contact microphones back to the four loudspeakers underneath the bowls. 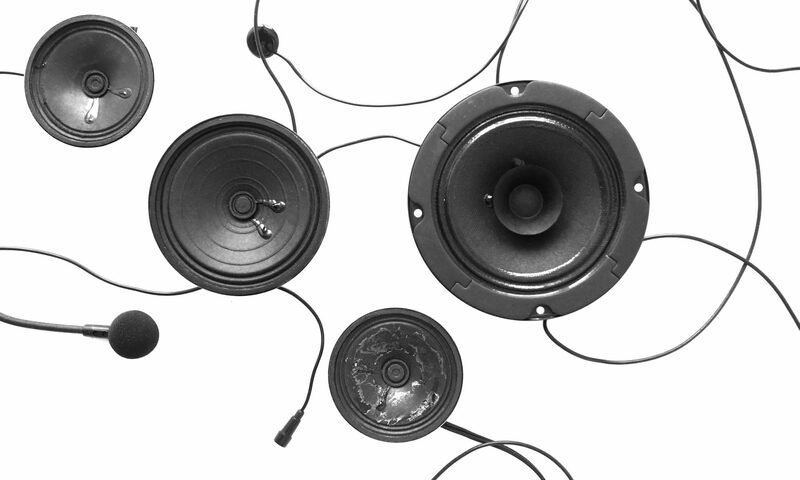 There is no direct feedback happening; but two loudspeakers and two microphones together produces one big feedback loop. The sound picked up by the contact microphone of player 1 is sent to the loudspeaker of player 3, which is then picked up by the contact microphone of player 3, creating a feedback loop by sending it to the loudspeaker of player 1. The same feedback is created between player 2 and 4.